Killer Characters: We're Going to Have a Party! If I hadn’t been drinking champagne at noon on Friday, I would have been over at the honey house with Manny Chapman, my beekeeping mentor and owner of Queen Bee Honey, and possibly, just possibly, I might have saved him from what must have been a very painful death. Instead, oblivious to his pending demise and feeling slightly tipsy, I popped open bottle number three and filled more flutes. • Cranberries from the northern part of the state, dried and fresh. • Whole grains, including Wisconsin wild rice, which is really aquatic grass seeds. • Wines from Door County wineries. • Thirty-five varieties of organic vegetables. • Apples from the Country Delight Farm just up the road. • And of course honey products: comb honey, bottled honey, bulk honey, honey candy, beeswax, and bee pollen. There’s nothing like the lure of freebies and discounts to bring out the best in people. Everyone in my little hometown made a point of stopping by my store to tip a glass and wish me well, whether they meant it or not. Well, maybe not everyone stopped by. My ex-husband Clay Lane didn’t show up, even though he lived only two blocks away and must have seen the banner tacked to the awning, announcing my freedom party. “You should call him up, Story,” Carrie Ann Retzlaff, my cousin and very part-time employee said in her husky chain-smoker’s voice. My cousin had close-cropped yellow-as-straw hair and a toothpick thin body, since she ingested more nicotine and alcohol than nutrients. “Invite the ex to join us,” she suggested. I scowled playfully to let her know that was a bad idea. Celebrating a divorce is a lot like celebrating a successful heart transplant. They both hurt like hell, and your quality of life would be much better if the issues leading up to the situation had never happened in the first place. But at least I can say I’m still in the game. Still alive and kicking. It’s all about attitude. And can you make it to my party? I can't make the book signing but I can promise that I am buying this book the day it releases! It sounds GREAT! Good Luck! Great story! I can't wait to read more. Congratulations on your upcoming release! Hey Story! Our stories are coming out the very same day, so I'm gonna be stuck here in Dalliance dealing with the fall out. I can't make it to your big party, but I'll sure be thinking about you! And as one "better off without'im" woman to another, congrats on your freedom! Don't miss this book! I got to read it early and I *loved* it! Can't wait to pick up my own personal copy too. Story and her friends (and foes) are just great! Can't wait to read your "story." Is there an explaination of your name? Yes, Denise, there is, but you'll have to read the book to find out! I'm looking forward to reading your story, Story. I won't be able to make the launch, but I'll be there virtually. I love your attitude, Story, and I can't wait to hear more! I have your book on pre-order. I have to confess, I'm a sucker for a discount! I'd have been in your shop too. 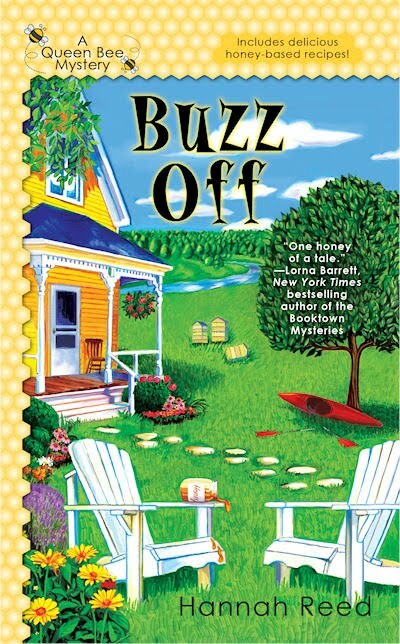 Sadly, won't be able to make it to the launch party, but will be picking up my copy of Buzz Off (and Scoop to Kill) the day they release! Can't wait. The Wild Clover sounds like the kind of place I would love to go to! I can't make the launch party but I will be picking up the book. I can't wait to read it.